If you’re after exotic new experiences, mouth-watering cuisine, cultural excursions, picturesque countryside and welcoming locals, this 10 Day 2 for 1 Vietnam holiday deal is tailored just for you. A free and easy-style tour with plenty of opportunities to explore on your own, this great value package will transport you to the dizzying metropolis of Ho Chi Minh City, the serene limestone islands of Halong Bay, the centuries old streets of historic Hanoi, and more. The trip includes return flights, two internal flights in Vietnam, seven nights hotel accommodation, an overnight cruise aboard a traditional Vietnamese junk boat and more. At this incredible 2-for-1 price, the history, culture and spectacular landscapes of Vietnam are within reach for both you and a friend! Have more time? Upgrade to the 13 day package with Sapa extension and discover the lush mountains and rice terraces of Sapa, and the culture of Vietnam’s H’mong people. Depart from either Sydney, Melbourne, *Brisbane, *Adelaide or Perth for your flight to Ho Chi Minh, Vietnam. Fly with either Vietnam Airlines, Emirates, Cathay Pacific or Singapore Airlines to name a few (subject to availability). On arrival be picked up and transferred to your hotel. Please note: due to flight scheduling and availability, some departures may occur on day 0. Affected customers must be at the airport the night before. Flight times will be indicated on your final documentation which you will receive prior to departure. Today enjoy a day at leisure to discover Ho Chi Minh City. This morning after breakfast be picked up from the hotel and travel to the city of My Tho (approx. 1.5 hours) on the banks of the Mekong. Upon arrival board a motor boat and cruise along the Mekong River. The boat will take you to Xep Canal, a lovely place where you will transfer to smaller canoes so you may navigate the smaller canals. These canals are lovely places where you can escape the traffic of the main river. Here you will cruise under coconut trees before arriving at a small islet. Disembark and walk around a small local village. Stop at a local family’s home to enjoy tropical fruit, honey tea and wine and listen to traditional Vietnamese music performed by the villagers. Afterwards continue onwards to another islet where a traditional Vietnamese lunch will be prepared by a local family (included). In the afternoon return to Ho Chi Minh City and your hotel accommodation. Inclusions: Transfers to and from your hotel, English speaking tour guide, Mekong River boat trip, lunch, honey tea and honey wine, seasonal fruits, traditional music performance. This morning be picked up from the hotel and head to the Cu Chi Tunnels (approx. 1 hour) for a half day tour. The Cu Chi Tunnels were constructed by Vietnamese fighters during the country’s long fight for independence. The network of tunnels which make up this underground city include living rooms, kitchens, hospitals, weapons factories, storage facilities and a command centre. 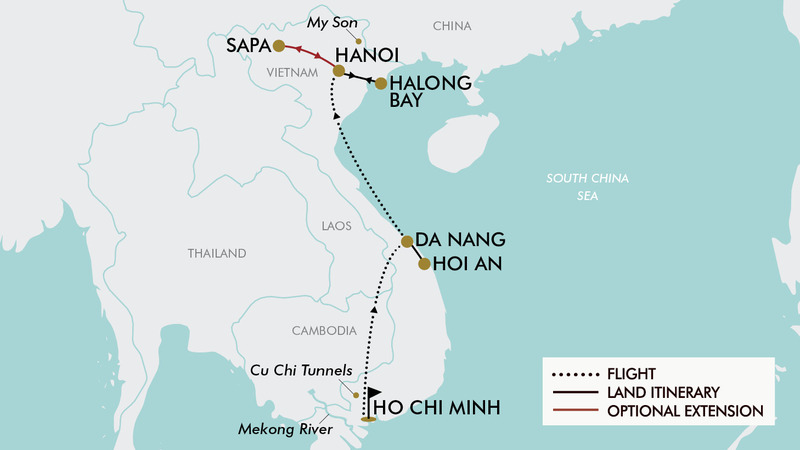 The tunnel system was an excellent way for the Vietcong to move around the countryside undetected by foreign troops and was at one stage home to around 10,000 people. After exploring these tunnels along with nearby remains of American tanks and numerous bomb craters drive back to Ho Chi Minh City arriving in the mid afternoon. The rest of the evening will be spent at leisure. After breakfast you will be transferred to the airport for the flight to Da Nang (approx. 1.5 hour flight). Upon arrival you will be transferred to your hotel accommodation in Hoi An. Graceful, historic Hoi An is Vietnam’s most atmospheric and delightful town. Once a major port, it boasts the grand architecture and beguiling riverside setting that befits its heritage, and the 21st-century curses of traffic and pollution are almost entirely absent. Today enjoy a day at leisure to discover Hoi An or join an optional activity. Depart early this morning and travel to My Son (approx. 1 hour), a UNESCO World Heritage site located 40km southwest of Hoi An. My Son was once the capital and religious centre of the Cham people, and is believed to be the longest inhabited archaeological site in Indochina. The ruins of My Son were built between the 7th to 13th century BC and are located in a valley surrounded by mountains, the sides of which are covered in thick jungle. Hon Quap (Cat’s Tooth Mountain) overlooks the site, its crooked peak mimicked by the architecture of some temples’ roofs. These mountains are the source of the Thu Bon River, a holy river which flows through the site. Lunch will be included at a local restaurant and after the day’s tour, be transferred back to the hotel in Hoi An. Inclusions: Transfers to and from your hotel to My Son Holy Land, English speaking tour guide. After breakfast you will be transfer back to Da Nang airport for your onwards flight to Hanoi, the capital city of Vietnam in the northern part of the country. (approx. 1.5 hour flight). Upon arrival you will be transferred to your hotel accommodation and you may enjoy the remainder of the day at leisure. This morning after breakfast drive through beautiful green rice paddy fields on the way to the coast (approx. 4 hours) where you will board a Junk boat for an overnight cruise through the thousands of towering limestone islands and emerald waters of Halong Bay. Enjoy a seafood lunch before taking part in some afternoon activities such as swimming, relaxing on a remote beach, climbing to the top of a lookout for an amazing panoramic view or take a ride on a rowing boat into a secluded bay. Also cruise further into the bay to visit a Pearl Farm. Drop anchor in the late evening for an overnight stay among the dramatic limestone peaks. Early risers can take part in an optional Tai Chi class on deck this morning. After breakfast, climb aboard the tender for a visit to Sung Sot (Surprise) Cave, a colourful grotto of giant stalactites and stalagmites. Return to the boat and enjoy a short cooking class where you will learn to prepare local delicacies such as spring rolls. Enjoy lunch on board, followed by a relaxing trip back into port, where you will disembark and return to Hanoi by bus (approx. 4 hours). This evening you will be picked up from your hotel and transferred to one of the best restaurants in the Hanoi’s famous Old Quarter - Duong’s Restaurant. Here you will enjoy many Vietnamese traditional dishes such as Goi Cuon tom thit (fresh roll with prawn and pork), Pho bo (noodle soup with beep), Bun Cha (BBQ pork in “nuoc mam” dressing eat with noodle), Goi Ga hoa chuoi (banana blossom salad with chicken) and Che nep dua (sticky rice in coconut cream). After the dinner you will transfer to a water puppet theatre for a spectacular water puppet show. Vietnamese water puppetry is a traditional and unique art of Vietnam. Each show lasts 45 minutes and includes lively illustrative Vietnamese pastoral scenes, rural daily life as well as fairy legends. (The itinerary may be adjusted if the water puppet show at 8:00pm is not available the water puppet show will be arranged at 6:30pm and the dinner at the restaurant after the show). Today transfer from your hotel to the airport for your return flight home to Australia. This morning after breakfast be picked up from the hotel and travel to the city of My Tho (approx. 1.5 hours) on the banks of the Mekong. Upon arrival board a motor boat and cruise along the Mekong River. The boat will take you to Xep Canal, a lovely place where you can escape the traffic of the main river. Here you will cruise under coconut trees before arriving at a small islet. Disembark and walk around a small local village. Stop at a local family’s home to enjoy tropical fruit, honey tea and wine and listen to traditional Vietnamese music performed by the villagers. Afterwards continue onwards to another islet where a traditional Vietnamese lunch will be prepared by a local family (included). In the afternoon return to Ho Chi Minh City and your hotel accommodation. Inclusions: Transfers to and from your hotel, English speaking tour guide, Mekong River boat trip, lunch, honey tea and honey wine, seasonal fruits, traditional music performance. After breakfast you will be transfer back to Da Nang airport for your onwards flight to Hanoi, the capital city of Vietnam in the northern part of the country. (approx. 1.5 hour flight). Upon arrival, you will be transferred to your hotel accommodation and you may enjoy the remainder of the day at leisure. This morning you will be picked up from your hotel early after breakfast and be driven to the mountainous town of Sapa in the North West of Vietnam (approx. 5 hours). Sa Pa is a town in the Hoàng Liên Son Mountains of northwestern Vietnam. A popular trekking base, it overlooks the picturesque terraced rice fields of the Muong Hoa Valley, and is near the 3,143m-tall Phang Xi Pang peak. Hill tribes and ethnic minorities, such as the Hmong, Tay and Dao, make up much of the town's local population. This afternoon take an afternoon hike through the picturesque tiered rice paddy fields to Ta Van village to learn more about the local ‘Zay’ people. This hike is approximately 7kms distance and is of a basic difficulty along well formed trails and cobbled steps. Please note the terrain on this hike is undulating but has no demanding ascents or descents. Alternatively customers who would prefer not to hike may enjoy time at leisure in Sapa town. After breakfast begin another hiking journey with a visit to two villages of the H’Mong people (Catcat and SinChai). The Hmong/Mong is an indigenous people in Asia. They are also one of the sub-groups of the Miao ethnicity in China. The Hmong began a gradual southward migration from China in the 18th century due to political unrest and to escape Chinese threats. Afterwards continue onwards to amazing Thac Bac (Silver) Waterfall and a hydroelectric power station established during the French occupation. Take in stunning landscapes of green forests and rice fields on the trek back to Sapa. This hike will be approximately 7km long and is of a basic difficulty along well formed trails and cobbled steps. Please note the terrain on this hike is undulating but has no demanding ascents or descents. For customers who are not comfortable with the hike, they can be driven to the base of these villages and walk the the remaining 3km down the village centres. Alternatively they may opt out of the hike and enjoy time at leisure in Sapa town. Today is spent at leisure in Sapa before transferring back to Hanoi in the afternoon (approx. 5 hours) and being dropped of at your hotel in the evening. The rest of the evening will be spent at leisure. Please note: all additional charges are payable direct to your Travel Consultant (unless otherwise stated). Travel offer is valid for travel on selected dates until the 20th December 2019. For solo travellers a full priced voucher must be purchased. Please note: dates/months with a *, †, ** or ^ incur a high season surcharge. † Flight High Season: $200 for 2 people. * Flight High Season: $500 for 2 people. ** Flight Peak Season: $1100 for 2 people. ^ Land High Season: $300 for 2 people. Sydney, Melbourne, *Brisbane, *Adelaide or Perth. *Brisbane or *Adelaide: $400 for 2 people. Vietnam Airlines, Malaysian Airlines, Singapore Airlines, Cathay Pacific, Emirates, Virgin Australia, Korean Airlines, Thai Airways, Japan Airlines, China Southern Airlines, China Airlines plus any codeshare partners (subject to availability). Vietnam Airlines and Vietjet Air (subject availability). - Business Class (international sectors only): Buy now for $7998 for 2 people. Please note: the 3 day Sapa extension is at a 3 star (standard) category regardless if you purchase the Standard or Premium core package. If purchasing the Premium package with Sapa extension, please note the hotel in Hanoi on Day 12 of the package will be at a 3 star (standard) category. Minimum group size 2, maximum group size 25 per vehicle. - prices are based on 2 people, are subject to availability, time permitting and weather conditions. - Recommended gratuities/tipping $10 AUD where tours or transfer services are included, which will be collected whilst on tour. Hanoi features a warm humid subtropical climate with plentiful precipitation. The city experiences the typical climate of northern Vietnam, with 4 distinct seasons. Summer, from May until August, is characterised by hot and humid weather with abundant rainfall usually falling in the afternoons. September to October is fall, characterised by a decrease in temperature and precipitation. Winter, from November to January, is dry and cool by national standards. The city is usually cloudy and foggy in winter, averaging only 1.5 hours of sunshine per day in February and March. The city has a tropical climate, specifically a tropical wet and dry climate, with an average humidity of 78–82%. The year is divided into two distinct seasons. The rainy season, with an average rainfall of about 1,800 millimetres annually (about 150 rainy days per year falling primarily in the afternoons), usually begins in May and ends in late October. The dry season lasts from December to April. The average temperature is 28 °C, with little variation throughout the year. Please note: a basic level of fitness will be required. If you will be participating in the treks on days 5 & 6 a moderate level of fitness is recommended. If you have any concerns please consult your healthcare provider prior to purchase/travel. Gratuities (tips) are not included in the tour price for services of the tour leader (when available) and driver throughout the tour. The recommended tip for the tour leader and driver is $10 AUD per person per day, which will be collected whilst on tour. Shopping overseas can be a daunting and confusing experience, especially when there is a language barrier. Please be very cautious when foreign currencies and prices are involved. If paying by credit card, please pay close attention to the amount you are being charged and keep all of your receipts. Do not make any purchases you are not comfortable with or feel pressured into. If you are uncertain or need assistance with the language barrier, please seek assistance from your Tour Guide/Leader. Please refer to our Terms and Conditions in regards to shopping for further information. From December 2017, Australians are eligible to apply online for a single entry electronic visa (e-visa), valid for up to a maximum of 30 days. Lodge your application online (for a non-refundable fee) with the Vietnamese National Web Portal of Immigration - https://www.xuatnhapcanh.gov.vn/ . You will be given a unique code to track your visa application status. Once your visa is granted, you must print it out and present it at check in. Keep this e-visa print out with you at all times during your travel in Vietnam. Some private online visa services and travel agents have scammed travellers or been involved in the public disclosure of the personal information of applicants for visas and 'visa issued on arrival' approval letters. To avoid such scams, only use official Government of Vietnam services to arrange your visa. Alternatively you can start your Visa application process once you receive your final travel documentation approximately 6 weeks prior to departure. A Vietnam Visa support letter can be provided on request via the tour operators email address provided in your travel documentation for $15 USD per person. You can then arrange your Visa at the border for $25 USD per person with 2 passport size photos. Alternatively you are welcome to arrange your Visa prior to departure through the consulate directly.